Notre-Dame de Paris (meaning "Our Lady of Paris"), also known as Notre-Dame Cathedral or simply Notre-Dame, is a medieval Catholic cathedral in Paris, France. The cathedral is widely considered to be one of the finest examples of French Gothic architecture, and is among the largest and most well-known church buildings in the world. The naturalism of its sculptures and stained glass are in contrast with earlier Romanesque architecture. 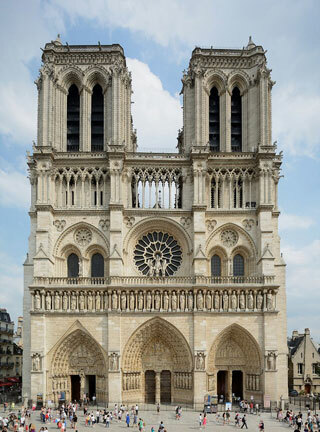 This article uses material from the Wikipedia article "Notre Dame de Paris", which is released under the Creative Commons Attribution-Share-Alike 3.0 License.